European Council President Donald Tusk, left, speaks with China's Prime Minister Li Keqiang prior to a group photo an EU-ASEM summit in Brussels (Oct. 19, 2018). The EU’s new strategy is arguably the most comprehensive so far in attempting to clearly set out the European approach, dimension, and perspective toward cooperation between Europe and Asia, and not only limited to connectivity. Although this strategy was not strictly targeted at the BRI, the careful wording, phrasing, and language chosen throughout the communication document reflected a significant degree of European acknowledgement of the BRI’s intentions and objectives. 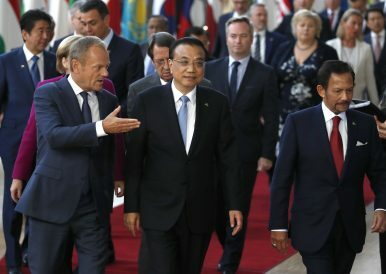 While China has exercised much caution and refrained from calling the BRI a “strategy,” and rather terming it an “initiative,” this new EU strategy signaled a wider European will and determination to take back leadership in light of what many Europeans see as China’s “increasing assertiveness.” In recent years, Europe has come to realize that this “assertiveness” has been at least in part empowered and fueled by the BRI. In 2017, China accounted for a staggering 65 billion euros (around $74 billion) of foreign direct investment in Europe, compared to 2 billion euros in 2010. Statistics about Chinese investments under the BRI seem to suggest that Beijing’s connectivity plans are gradually taking shape. However, the EU is attempting to set out an alternative to try to appeal to target countries, most notably to those in the European Neighborhood Region across the Balkans and the Caucuses, where Chinese investments have increased notably in the last decade. The new EU strategy on connectivity between Europe and Asia emphasized three core aspects: “sustainable connectivity,” “comprehensive connectivity,” and “international rules-based connectivity.” While some common ground and areas can be observed between the EU and China, the EU’s new strategy seems to set out very different principles to those of China’s BRI. The first principle of “sustainable connectivity” states that “investments need to ensure market efficiency and be fiscally viable.” The phrase “fiscally viable” seems quite clearly targeted toward China, as Europe is highly concerned over the sustainability of astronomical investment figures – many of them funded through loans. In a forum at the European Parliament in September, there was much discussion and concern about the BRI’s investment projects in Europe, which are “high risk in nature.” For example, the Chinese-financed national highway project in Montenegro raised concern and unease among Eurocrats. At first, the project, which was largely decided by Dusko Markovic (who was criticized for taking a gigantic risk on behalf of the country) and the Chinese, looked to revitalize the Montenegrin economy and upgrade its lagging infrastructure. However, primarily due to this project, Montenegro’s debt-to-GDP ratio has now reached an alarming 80 percent. Such a project has lessons about the BRI modus operandi, which the Chinese describe as “win-win cooperation that promotes common development and prosperity…by enhancing mutual understanding and trust.” In the case of Montenegro, it seems that such “mutual respect” and “win-win cooperation” has been somewhat achieved (albeit with the “win-win” heavily slanting toward the Chinese side). Yet looking beneath the surface would reveal that this “win-win cooperation” has remained at the national or elitist level – profiting those who made the decisions — rather than ensuring benefits trickle down to a local or public level. And the result is now leaving the country in severe debt. In many ways, this also reflects China’s top-down leadership approach to policymaking processes and projects. This contrasts starkly with the EU’s intergovernmental or supranational decision-making, where power is delegated upward through majority or consensus (although admittedly decisions take a much longer time to make it through these complex legislative, executive, and judicial procedures). The EU’s new strategy further stressed “high standards of transparency and good governance” in connectivity projects, “giving a voice to the people affected by the projects, based on appropriate public consultations.” Therefore, this Chinese-inspired top-down model is unsettling in the eyes of the EU. This is one very significant (political) gap in which Europe and China has not found any common ground to work on. While the EU’s strategy advocates the concept of “giving a voice to the people affected by the projects,” it also sends an implied message addressing China’s lack of public consultation and procurement for several large-scale BRI projects. (Incidentally, the BRI also talks about “connecting people,” but this remains mostly seen through cultural exchange and at the elite level, rather than involving a dynamic, open interaction between various levels of decision-making). The lack of consultation has been exemplified by the Hungary-Serbia Railway construction project, another pilot project of the BRI. The railway has been scrutinized and investigated by the European Commission for a lack of transparency in the tendering and procurement procedures, as well as unsustainable credit lines from China that would burden Hungary and Serbia with very high interest rates. This is what the EU sees as an “unsustainable connectivity project” in the longer term. Yet China has hoped that countries that benefit from the BRI would also subscribe to, accept, and recognize the Chinese mode of operation. Despite China’s declaration that the BRI “would not change practices of others” and “would adapt to local customs and norms based on mutual respect,” the way in which Beijing has actually engaged in BRI projects suggests otherwise. China does not want to be perceived as imposing ideologies onto others; however, it has in many ways exported its own development model to targeted countries. Those who have followed the course of the BRI so far are beginning to find themselves with a significant financial burden, which looks increasingly unsustainable. This could eventually pose greater challenges than the opportunities that were first offered to the target countries, as connectivity has come at a great cost. Perhaps the largest difference between the BRI and the EU’s new strategy is the third aspect outlined by the EU: “international rules-based connectivity,” an aspect which the EU has always stressed, even well before the publication of the new strategy. The keyword underlined by the EU is a “level-playing field,” a goal quite apparently aimed at China, which has a much greater trade/investment deficit and more restrictions on foreign investment compared with other Asian countries. As the EU becomes increasingly concerned about largescale investment activities from China, it calls for reciprocity. A rapidly increasing gap in trade and now in investment between the EU and China has gradually led Europe to introduce investment-screening mechanisms, and allow member states to address what they perceive as threatening investments concerning national security. In this context, the BRI should also think of an effective response by opening up key sectors in China, and allowing multilevel involvement and participation in its decision-making processes in its projects. This may be against the will and the design of the BRI, but China’s success in its connectivity projects depends on the keenness and readiness of the targeted countries in cooperation. The greatest challenge for China in response to the EU’s strategy is that of “commonly agreed, rules-based cooperation”: one core component of the BRI is to have flexibility to “decide rules on-the-go,” thereby setting a new mode of cooperation. It would therefore indeed be difficult for the BRI to adhere to a hard rules-based game that would require genuine submission to multilateral agreements and constraints. Since 2015, China has been waiting for reactions from its European counterparts to further advance the BRI, particularly in Europe. The vast majority of this new EU strategy is now indeed targeted toward China as a direct response to the BRI. Thus it is high time for China to study this strategy with great care and attention, as the BRI’s success in the coming years would highly depend on China’s efforts and readiness in understanding and adapting to local norms, cultures, rules, and practices in the countries it wants to partner with, rather than simply exporting its developmental model abroad. The question remains how and whether China would respond to this new EU strategy in terms of identifying and seeking cooperation on common areas, or whether China will decide to continue advancing its own BRI agenda despite increasing challenges, criticisms, and setbacks. So far, there are sometimes illusions that the EU and China are moving closer toward each other by deploying common catchwords, but much work needs to be done in order to increase potential areas for cooperation. The EU aims to “inspire others with sustainable, rules-based order” while China operates on “a principle of mutual respect and win-win cooperation.” If China can come up with an effective response and readjust its BRI accordingly by concretely acknowledging and readapting to the EU’s strategy through careful negotiation and compromise, it can prove to be a golden opportunity for synergy and synthesis between the two plans. But if not, there could be some heavily turbulent times ahead for the BRI. Julian Chan is a founding member of the Institute of China-Europe Affairs, a former member of the Political and Economic department at the Asia-Europe Foundation and the Europe Asia Policy Centre for Comparative Research, with a Master’s in EU International Relations and Diplomacy Studies from the College of Europe. China is playing an increasingly active role in Serbia, part of its expansion in Central and Eastern Europe.